Freedom is the key to any great vacation. That means the freedom to see new countries, dive into different cultures & cuisines, and uncover hidden gems along the way. But a perfect trip should also mean relaxing exactly the way you want. That’s why Thrillist partnered with Norwegian Cruise Line to sail us to some of their many unique ports of call, so we can show you how to tackle your best day trip. 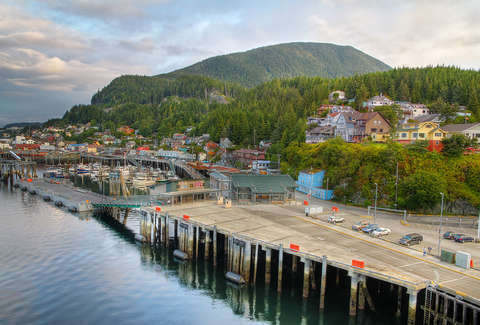 And whether you’re zip lining over Ketchikan’s Knudson Cove, or driving a Jeep through Tongass National Forest, cruising with Norwegian means you always come home to amazing food, entertainment, and accommodations to recharge for the discoveries to come. When you have a limited amount of time in a destination, narrowing down where you’ll spend your day can feel overwhelming. That’s especially true in a city like Ketchikan, where more than 2 million acres of national forest, endless fresh seafood, and plenty of flannel-wearing lumberjacks await. But with this handy guide, you’ll be able to make the most of your day trip, without feeling rushed through Alaska’s First City. You’d be remiss to visit Ketchikan and not grab a burger from this takeaway window that’s attached to Asylum Bar (more on that later). First thing to know though: Burger Queen isn’t some off-label Alaskan fast-food chain. This place has 30 different kinds of milk shakes (including grape which… sure?) and 10 different burger varieties, including an option with a polish sausage and beef patty. Ketchikan is known as “the salmon capital of the world” so you can bet that they know how to prepare the fish in a few unique ways. 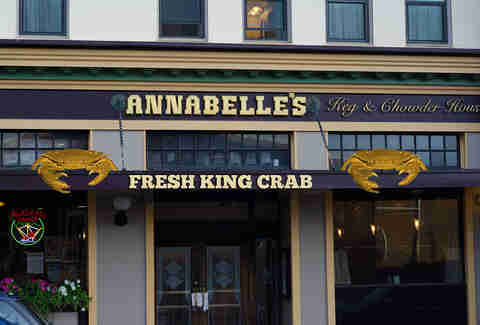 At Annabelle’s, that includes a smoked salmon dip, tacos, linguine, chowder, and more. The restaurant has been around since 1927 inside the historic Gilmore Hotel, and still emanates a 1920s vibe -- including vintage slot machines from when Ketchikan felt more like the Wild West. If you’re stopping by for lunch, you can grab a quick beer and a bowl of steaming chowder to warm you up, or, if you’re feeling fancier, it’s also ideal for a sit-down dinner. Alava’s says they don’t serve breakfast because they are out “catching your lunch” (seriously, it’s on a sign outside the eatery) so you can bet that the fish here is as fresh as you’ll find. This tiny, no-frills seafood shack makes everything homemade, right down to the tartar sauce, and is best known for their classic fish and chips combo with halibut or cod. A few menu options change seasonally, but their famous chowder is always available if you’re looking for a quick and cozy lunch before you continue on the rest of your journey. Few bars can obtain “local legend” status without going the way of a tourist trap -- but Ketchikan’s Arctic Bar did just that. It’s been a logging bar -- Alaskan for no-frills dive bar -- for 80 years and pays homage to Ketchikan’s history through decor and memorabilia throughout. (This includes their iconic pair of NSFW “happy bears” you’ll need to snap a pic of before you leave.) Both cruise-goers and Ketchikan locals belly up to the bar for Alaskan beers and housemade Bloody Mary’s, so be sure to grab one on their waterfront deck before you leave port. If sampling local craft brews is one of your vacation must-do’s, Asylum Bar is the place to go. 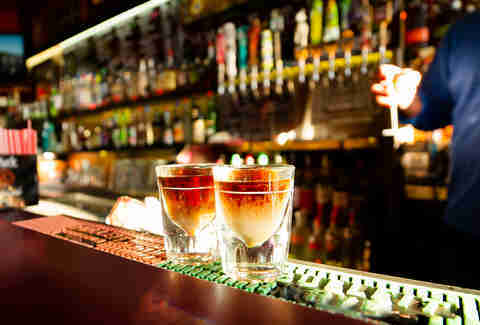 The bar boasts that it has the “largest selection of locally brewed draft beers” in Alaska, with 22 options on draft. And you won’t break the bank trying them, either, since a pour is $3.50. Besides cheap local beers, Asylum Bar also has four different bars to drink at, with indoor and outdoor options, and is known to host themed events and parties throughout the year. Creek Street isn’t actually a street at all -- it’s a boardwalk that runs through Ketchikan’s historic center to the east of Ketchikan Creek. Today, this area is full of shops, galleries, and local eateries to explore, but you should prioritize a stop at artist Ray Troll’s gallery, Soho Coho. Troll is a native of Ketchikan and creates colorful, nature-inspired scenes that you can peruse in the gallery, or purchase, if you’re in the market for some wall art. Afterward, take a quick hike down “Married Man’s Trail” -- a “secret” wooden extension of the Creek Street boardwalk that used to provide discreet access to the boardwalk when it was Ketchikan’s red light district. (We told you the town had a Wild West past). The trail will lead into the woods and eventually to Salmon Ladder, where you can see salmon trying to jump into the waterfall and continue upstream. Misty Fjords National Monument is 2.2 million acres of national wilderness, so obviously you’re not going to see it all in one day trip. The best way to take in these views, which are literally unlike anywhere else in the United States, is by seaplane or boat, which travel through Behm Canal in the heart of the monument. 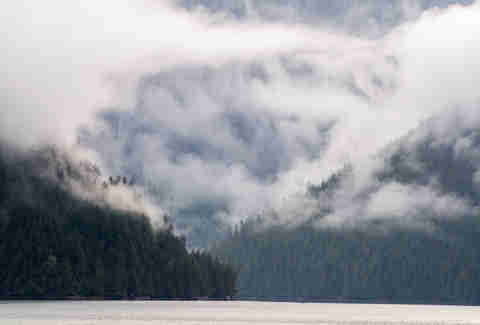 Along the way, you could see an abundance of native wildlife, from killer whales to porpoises, mountain goats, or bears. Besides Behm Canal, mineral springs and volcanic lava flows are also located in the monument, so be prepared for unparalleled sights. Long before Ketchikan was a popular stop for cruise ships, forestry was one of the town’s main industries -- and lumberjacks are a storied part of that history. The Great Alaskan Lumberjack Show celebrates that by challenging lumberjacks to a dozen themed feats of strength, be that weilding a seven-pound axe or souped-up chainsaw, or climbing up trees. The shows run about an hour and happen multiple times each day, so it’s an easy event to fit in to your on-land excursion (plus, it’s just a block from the cruise ship docks.) Sporting flannel is recommended, but not mandatory, of course. Alaska’s Native American heritage spans centuries, and Southeast Alaska (where Ketchikan is located) is home to three groups in particular: the Tlingit, Haida, and Tsimshian. The Totem Heritage Center is one of the most picturesque spots to get a glimpse of this native culture, as it’s situated along Ketchikan Creek surrounded by a rainforest path. Inside, you’ll find one of the largest collections of original, 19th century totem poles on the planet, as well as baskets, carvings, and old photographs. There are also ongoing classes and programs where people still make these totems frequently, so you can drop in and watch them actually be created.